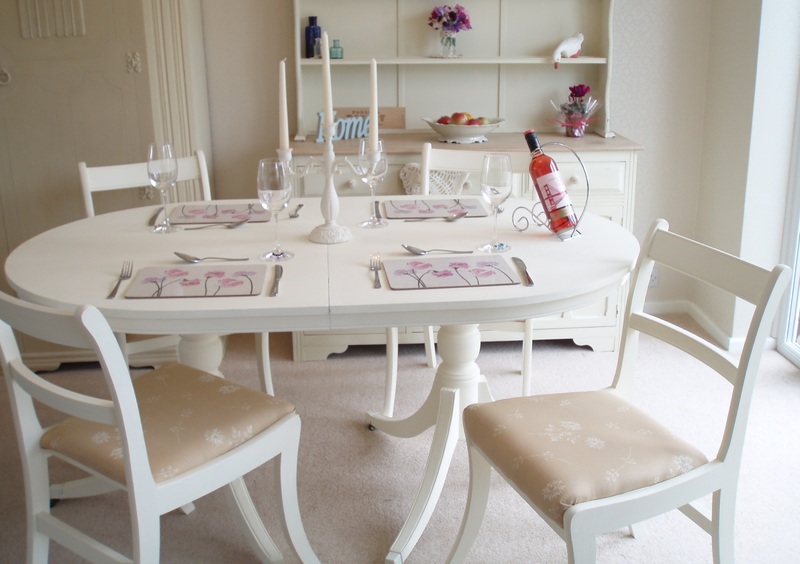 A stunning hand painted elegant dining table and 4 chairs. This set has been painted in the fantastic `Regency White` ~ Autentico; pure and natural paint. This is a classic colour and would go with most colour schemes. The chair seat pads have been reupholstered in the highest quality ~ Vanessa Arbuthnott, French Floral ~ Straw, fabric which compliments the paint beautifully and provides a cottage chic charm. The table has been finished with 2 coats of Autentico Sealant, however painted table tops should still be handled with care and coasters! The chairs have been waxed to set and protect the paint. The table has two elegant pedestals, with curved legs, providing a graceful look whilst securely supporting each end. As this set has been hand painted there may well be signs of texture, so it is not for someone looking for a factory finish. This is a fantastic elegant set a definite show piece for a pretty country kitchen or dining room. As a preloved character set it has the associated knocks and dings that vintage and reclaimed furniture picks up from age and use, the price reflects this. As with all Restored to be Adored pieces this is not new or mass produced, it is a customised one off item that has been painted with care but without making it look new or perfect, as this would lose the character of the piece! It is an elegant and charming set. Delivery can be arranged within 25 mile radius of Maidstone, Kent ~ £50.00. Unfortunately I can’t provide a personal delivery service outside this radius but please do contact me to arrange a collection or courier.